Washington: In April, the Quileute tribe held their Whale Welcome. The day celebrates the migration of gray whales from their winter birthing grounds in California and Mexico to their summer homes in Alaska's Bering Sea. "They have offered us their wealth in giving us spirituality, being part of our ceremonies, and giving of themselves to nurture our body. We now proclaim this day and its events a day of honoring our kin, the whale. We will now begin the day with events that uplift our spiritual relationship with the grays, orcas, and other whales as they return, live, and swim to bless our waters and enhance us with good fortune throughout the year." At the 2009 Whale Welcome event, a pod of whales approached the beach as the group sent an offering of fish into the ocean. Chris Morganroth III, a tribal elder and storyteller served as this year's master of ceremonies. The Quileute drummed, sang, danced and told stories in honor of whales. The event is put on annually by the Quileute Tribal School. 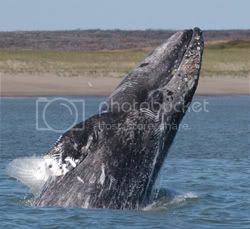 Gray whales can weigh up to 40 tons and grow as long as 45 feet. Mother whales with calves often roll just beyond the surf, while the males don't get as close to the shore. Mother whales usually begin to show up in early to mid-April, while the early whales start appearing off the beach a little sooner. Gray whales feed primarily on bottom-dwelling organisms, taking in mouthfuls of sediment and sieving through it for their prey.